Global leaders are preparing to meet in New York on September 19 and 20 to chart the way forward to tackle noncommunicable diseases, the number one killer in the world. On the stealth, the pharma and food industries and some rich countries are also at work to weaken the initiative. After HIV/AIDS, this is the second time in the history of the UN the General Assembly will meet on a health issue, as noncommunicable diseases (NCD) have a major socio-economic impact. A 2010 World Economic Forum report says they are the “second most severe threat to the global economy”. Low- and middle-income countries like India, which are unable to tackle these chronic diseases, pin their hope on the summit. Once these diseases become global priority, world leaders will commit to a coordinated approach, substantially extending financial assistance. In a series of consultations leading up to the UN summit, its health wing, the World Health Organization (WHO), held discussions with countries to understand the prevalence of the diseases, national plannings and their expectations from international agencies. In April it held a global ministerial meeting at Moscow to consolidate the information on noncommunicable diseases. Consultations are also being held by civil society groups, health experts and patient groups. But there is a growing fear that the industry might push its interest by influencing opinion. At the ministerial meeting in Moscow, leaders from low- and middle-income countries expressed the need for setting up a global fund to tackle the diseases. Of the 35 million deaths from noncommunicable diseases across the globe every year, 80 per cent occur in these countries. But public health experts are not sure if the demand for global fund will make its way for discussion at the UN summit, given the industry lobby. After the ministerial meeting, alliances of doctors and patient groups and the pharma industry, such as The Lancet NCD Action Group and NCD Alliance, convened a meeting. In their submission to the UN, they refuted the need for a global fund. Answer to the monetary problem lies in the efficient use of existing resources and innovative financing methods, they noted in their submission. Their stance is instead of treatment, the UN should focus on prevention of diseases by spreading awareness and following healthy lifestyle. Their submission seems to protect the interest of the industry. It is evident from the fact that member groups of these alliances receive funds from pharma industry. NCD Alliance, for instance, consists of four patient groups and all of them receive aid from pharma companies. One group, the International Diabetes Federation, is partner of multinational pharma companies like Lilly, Novo Nordisk, Sanofi Aventis, Abbott Diabetes Care, Merck and Pfizer. K Gopakumar of the Third World Network-India, an international non-profit, explains reason for this clandestine act of the industry. “The pharmaceutical industry wants to protect itself from price reduction and compulsory licence by pushing the focus of the conference on prevention rather than treatment of noncommunicable diseases,” he says. Industry pressure was also palpable during the ministerial meeting. Representatives from corporations such as PepsiCo, Coca Cola, Nestle, the World Federation of Advertisers and the International Food and Beverage Alliance (IFBA) participated in it. The working group on food and drink was chaired by a representative from Coca Cola. IFBA representative suggested the industry would go for a voluntary self-regulation to reformulate foods, for example, by reducing salt and trans-fat content, extend responsible advertising and support government and non-government agencies in creating awareness about the diseases and healthy lifestyles. But evidence shows self-regulation by the industry does not work. Government regulation is the only solution. “Companies which are responsible for causing noncommunicable diseases, for example, Nestle that promotes baby food as a substitute for mother’s milk, should not have been invited to such meetings,” says Arun Gupta, convenor of Alliance against Conflict of Interest, a network of organisations and individuals from various fields. There is evidence to show that breastfeeding during infancy protects from such diseases more than efforts such as salt reduction, explains Gupta, also coordinator of Breastfeeding Promotion Network of India. WHO’s dependence on the industry was evident from the closing remarks of Director-General Margaret Chan at the meeting who made repeated calls for increased role of the private sector and funding from them. Countries too seem to be divided over considering noncommunicable diseases a global priority. The draft document for discussion at the UN meeting is now open for comments by different governments. Some of the comments leaked to non-profits in July show that rich countries like the US, Canada and those in the EU were not happy with the use of word “epidemic” for noncommunicable diseases. They want it to be replaced by “steep rise” or “rapidly growing”. “This could be because of issues related to providing resources, using TRIPS (Trade Related Aspects of Intellectual Property Rights) flexibilities, lack of time-bound targets and follow-up mechanisms,” says Aria Ilyad Ahmad of the Young Professional Chronic Disease Network, an international group of doctors. The name of the UN “Outcomes Document” has been proposed to change to “Political Declaration”. For the first, the government could be held accountable while the second could end up just as political jargon. Demands are also high to broaden the definition of noncommunicable diseases. 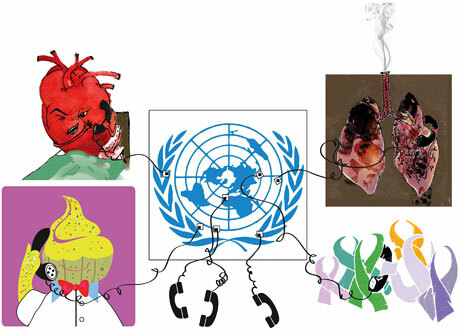 Analysts say WHO must change its four-decade-old definition of noncommunicable diseases, which includes only heart diseases, cancers, diabetes and chronic respiratory diseases. Else, the summit will draw a blank on growing number of other problems like mental illnesses and diseases due to pollution. Mental illnesses, for instance, contribute 28 per cent to the burden of noncommunicable diseases in the world in terms of disability adjusted life years (days lost due to the illness). About 90 per cent of the people suffering from mental illnesses in low- and middle-income countries do not have access to medical treatment. The Indian representative to the ministerial meeting at Moscow had also spoken in favour of including mental illnesses in the list of noncommunicable diseases. Chronic diseases like diabetes and cardiovascular diseases are linked to mental health. Besides, there is enough evidence that links air pollution to cancers and asthma. Toxins like pesticides in food can also cause cancer. “This is a good opportunity to discuss the definition (of noncommunicable diseases) as we might not have an opportunity to discuss it any time soon,” says Leena Menghaney of Medecins Sans Frontieres (MSF), an international humanitarian aid organisation. Organisations like MSF, Oxfam and Third World Network suggest that in view of the growing number of non-communicable diseases worldwide, it is imperative to safeguard generic production of drugs to ensure treatment to all the affected people. It is important to note that most global litigations on access to drugs are related to noncommunicable diseases. For example, the Supreme Court of India is hearing a case filed by Novartis, a Swiss pharma company. Novartis wants to extend its patent on an anti-cancer drug, Glivec. Cancer Patients Aid Association, a non-profit, is against it, as patent extension would stand in the way of making cheaper generic drugs (see ‘Evergreen Novartis’). “What governments commit at the UN summit is what the judges will look at during the court cases,” says Kajal Bharadwaj, lawyer with MSF. For India, one of the major countries where noncommunicable diseases are spreading in epidemic proportions, the final outcome of the meeting is crucial. It has already prepared the white paper to present at the UN summit (see ‘India’s stand at UN’). To strengthen the outcome, efforts are on to ensure that the prime minister is present at the summit. There is a need to ensure that the decision taken at the summit is not limited to some exhortations like exercise, diet, smoking and alcohol, says Amit Sengupta of People Health Movement, an international public health coalition. The summit holds a possibility to address underlying social determinants like availability of healthy food and area to exercise, and expand public health services, he suggests. Why not promotion of Yoga ,Exercises and Ayurved the real and economical solution to these diseases discussed?